This sweet and spicy mix, with its citrus notes and herbaceous complements, is the best aroma to greet you when you walk in your front door. 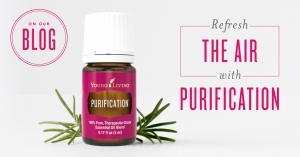 Purification brings about feelings of peace and contentment, whether you and your loved ones are crowded around the kitchen table, sprawled out in the family room for game night, or dancing through the house as you tackle cleaning projects. Your overnight guests need three things when they arrive at your home: Fresh towels, spare toothbrushes, and sheets that harbor the rich smell of Purification. Between the components of Citronella and Lemongrass, Purification is a game-changer in the bathroom. There are so many ways to use it! Put two drops on the inside of the toilet paper roll for a fresh scent. Add a drop or two to a cotton ball and store between trash cans and liners to keep your bathroom smelling beautiful. Uplift your whole bathroom by diffusing Purification with Lemon essential oil to help the air smell squeaky clean! Now that your house is home to a welcoming aroma, conquer musty smells everywhere else. Use a USB Orb diffuser in your car to combat all the scents that build up from gym bags, kids’ soccer shoes, and pizza take-out. You can also use that nifty cotton ball trick you learned about above—store them in air vents, under floor mats, and in the pockets behind the front seats. Learn more about this carefully crafted essential oil blend and its origins. Watch this quick snapshot! Purify your life for free! We are giving three randomly selected people a bottle of Purification essential oil blend (Retail value $20.72). Comment on this post for your shot at winning free Purification! Contest ends at 11:59 p.m., MT, on Wednesday, May 4. Three winners will be chosen at random and announced on this blog post on Friday, May 9. Want to know what other Young Living oils we consider must-haves? Read and learn more about Thieves® and Valor® essential oil blends. Where else do you use the power of Purification? Spread your knowledge in the comments below.